Taking place in New Orleans – one of the world’s most exciting, energetic and vibrant cities - TribeFest 2014, a festival for Jewish young adults to be entertained and inspired, boasts an impressive roster of speakers and performers including Scandal’s Josh Malina, Pitch Perfect's Ben Platt, Ikar founder/leader Rabbi Sharon Brous, LIVESSTRONG's Doug Ulman and the band Soulfarm and more. But with a lineup like this, you’d better register now to be part of what promises to be an unforgettable experience. And, with this year’s TribeFest taking place over Purim from March 16 to 18, it’s appropriate that it’s taking place in “The Big Easy”, a city known internationally for its Mardi Gras, where costumes and masks are part of the fun. All Tribefest attendees are invited to an awesome Purim Party the night before TribeFest officially kicks off, at 7:30 pm on Saturday, March 15th with everything you’d expect, including an open bar – and more! But Purim aside, TribeFest 2014 truly offers something for everyone. Looking to do some good in the world (and who isn’t?) - TribeFest has eight service project options available on Monday morning, March 17th. Make a difference in our host community of New Orleans! Projects have limited space and will be awarded on a first-come-first-serve basis – we highly recommend to sign up as soon as possible to get your first choice! Are you a leader in your community? Have you been to national events but want to get more involved locally? TribeFest offers a myriad of unique, inspiring leadership sessions open to attendees. 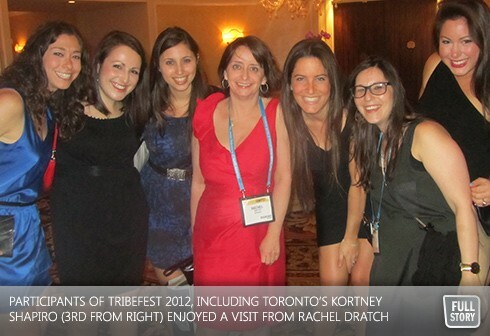 For Toronto’s Kortney Shapiro, 24, who attended TribeFest 2012 in Las Vegas where some 1,500 Members of the Tribe between the ages of 22-to-45 celebrated in the Mojave Desert, the event not only connected her to like-minded Jews from around the world, but inspired her to become even more involved in, and to give back to, Jewish Toronto and the Jewish community at-large. Note: The guaranteed rate on our block of hotel rooms closes this Friday, so register today. For more information, or to register for TribeFest 2014, contact Leanne Campbell at lcampbell@ujafed.org, or by phone at 416.631.5670 or visit tribefest.org.